The good news (if fleeting) is that Himalayan Glaciers, while retreating like most glaciers across the globe, will still be intact in 2035. The bad news is that what I can only describe as an egregious error asserted that they would be gone by 2035 made it into Working Group II's report. Glaciers in the Himalaya are receding faster than in any other part of the world (see Table 10.9) and, if the present rate continues, the likelihood of them disappearing by the year 2035 and perhaps sooner is very high if the Earth keeps warming at the current rate. Its total area will likely shrink from the present 500,000 to 100,000 km2 by the year 2035." The good news (if fleeting) is that Himalayan Glaciers, while retreating like most glaciers across the globe, will still be intact in 2035. The bad news is that what I can only describe as an egregious error asserted that they would be gone by 2035 made it into Working Group II's report and remained there as accepted fact until challenged last November exposing what is essentially a blunder of mistaking 2350 for 2035. (Atmo.Sphere does a fantastic job unraveling the whole mess). Glacier melt in the Himalayas is projected to increase flooding, and rock avalanches from destabilised slopes, and to affect water resources within the next two to three decades. 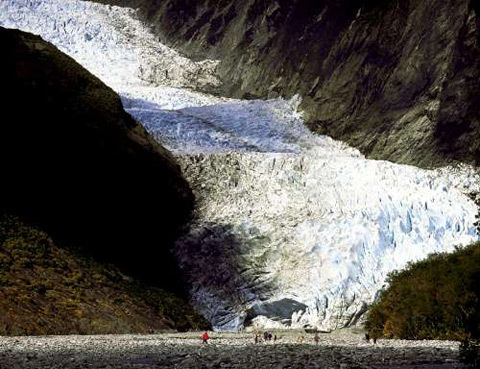 This will be followed by decreased river flows as the glaciers recede." Widespread mass losses from glaciers and reductions in snow cover over recent decades are projected to accelerate throughout the 21st century, reducing water availability, hydropower potential, and changing seasonality of flows in regions supplied by meltwater from major mountain ranges (e.g. Hindu-Kush, Himalaya, Andes)"
As Bill Chameides writes in Huffington Post, the IPCC assessment reports are ostensibly statements of consensus. That the summary reports did not include the contention that Himalayan glaciers would disappear by 2035 indicates it "was not the consensus of the scientists who worked on the IPCC." Well, that's fine and dandy, but, as Chameides writes, "It is unfortunate that, perhaps because it was the most sensational, the disappearing-by-2035 statement about the Himalayas was the one that got the most attention." Making matters worse are reports that leaders in the IPCC chose to dismiss out of hand criticism of the statement as far back as 2006, instead reacting with apparent arrogance and defensiveness. It has, however, recently come to our attention that a paragraph in the 938-page Working Group II contribution to the underlying assessment2 refers to poorly substantiated estimates of rate of recession and date for the disappearance of Himalayan glaciers. In drafting the paragraph in question, the clear and well-established standards of evidence, required by the IPCC procedures, were not applied properly. The Chair, Vice-Chairs, and Co-chairs of the IPCC regret the poor application of well-established IPCC procedures in this instance. This episode demonstrates that the quality of the assessment depends on absolute adherence to the IPCC standards, including thorough review of the quality and validity of each source before incorporating results from the source into an IPCC Report 3. We reaffirm our strong commitment to ensuring this level of performance. If only the IPCC had applied those standards in this case three years ago, instead of assuming they could do no wrong. Of course, I can't say it was their assumption, but at least for that one paragraph that's the way it looks. I don't have to say that the Lord Moncktons and Tim Balls of climate change denial are all over this, along with the attendant denier camp frothing at the mouth and looking for ways to expose the "Gore-Worshiping, Socialist Conspiracy" that is climate change (in their minds). Worse than all that (for there is little hope of changing those minds) is the average person going about their daily lives and trying to make sense of a very complex subject caught in the middle of what is most often a juvenile shouting match between two increasingly polarized opposites (just check out some of the comments on this blog for examples). For the IPCC to say little more than "oops, sorry, it's all good now" isn't enough. Now is not the time for slipshod adherence to rigorous scientific standards to come to light. Empirical evidence indicates that the Fourth Assessment Report from the IPCC actually underestimates many of the projected effects of climate change, including sea level rise and ice loss. But such a glaring error in a paragraph tucked in a 938-page supporting document is what is getting the attention. Such sloppiness from the IPCC is not acceptable. We all have a right to ask what other errors lurk inside the IPCC's reports. It must be said that any human endeavor is fraught with error. That said, I am disappointed and hope the IPCC will use this opportunity for reflection, evaluation, and renewed allegiance to the scientific principals upon which we all depend. Newsy brings about a good point and I hope this issue doesn't give off the idea that the global warming issue is not as pertinent as once thought. http://www.newsy.com/videos/glacier-sized-problem-for-climate-change-panel Something needs to be done regardless of when the polar ice caps are predicted to melt to extend the years even more so. Climate Chief Pachauri has ruined his reputation in the scientific community and the public-at-large by pushing the faulty Himalayan-glacier estimates. If the IPCC is to restore its reputation and become an effective advocate for climate change legislation, they need a new leader and more transparent research reporting mechanisms. Himalayagate cannot happen again. Interested in climate change, clean energy, or energy efficiency? Go to http://www.greencollareconomy.com for sustainability white papers and the largest b2b green directory on the web. It's still almost impossible to make accurate predictions on any single part of the climate or environment during this period of change. The changes we have already made to our climate are causing further changes that are often not accounted for in further predictions. Most if not all predictions have not been comprehensive enough to give accurate predictions. IPCC reports are full of little mistakes such as this. That is no reason to throw away the entire agenda. Saving the planet is a worthy crusade, a sacred duty. If we must stretch the truth a bit in order to follow our hearts, so be it. How could we be wrong when we have the entire fate of the planet in our hands? It is incredible that there is still much hot air spouted about whether there is a change happening when around the world people are suffering the effects of climate change right now. Is the International Target of 2 Degrees Warming a "Pipe Dream?"